Installing trim work such as crown molding, chair rail and wainscoting is one of the quickest ways to add distinction to nearly any living space. We are an experienced general contractor and home renovation company that specializes in finish carpentry projects in the Orlando area. Crown molding and chair rail are two types of trims that are most requested by our clients. 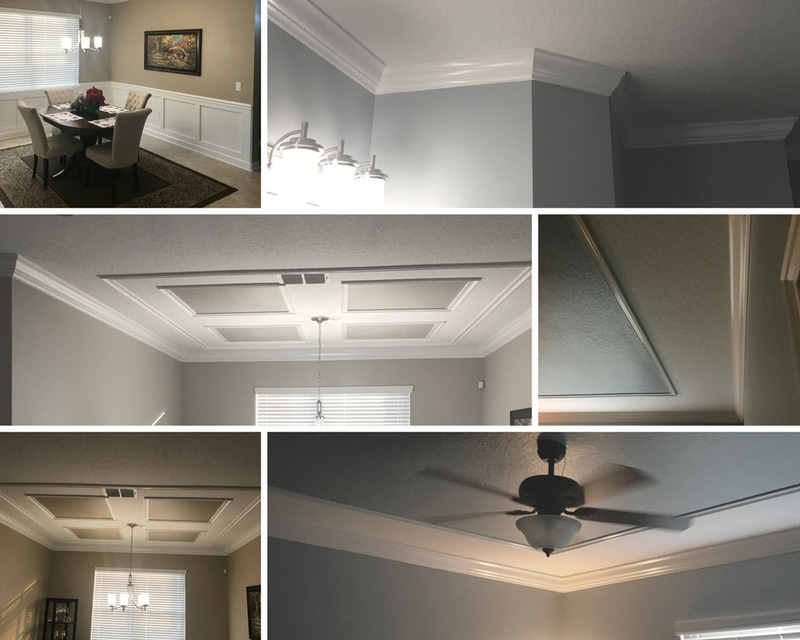 Crown moldings, which are also termed crown moldings, are pieces of trim that are usually installed in the spaces where ceilings and walls meet. They really help to elegantly frame rooms. Trim that is applied to a wall at about 32 inches to 40 inches from the floor is called chair rail. The placement of the wall trim represents the height of standard chairs, and the rails were traditionally installed to protect walls from being damaged by frequently moving chairs in dining areas. Today, chair rail is used mainly for decoration. Here are some interesting facts about crown molding and chair rail trims, which highlight the reasons why our team of carpentry experts recommend their installation throughout homes and commercial structures. See a collage I made from one of our Orlando jobs. There is no mistaking the look of delight when prospective home buyers enter a room that is enhanced by fine finish work. Crown molding makes the plainest of rooms look well dressed. That dramatic improvement doesn’t just equate to a more attractive room. In some cases, installing trim can result in a slight property value boost. According to Tyke Appraisalsâ€™ Mike Kokenko, trim upgrades can help property owners to sell their homes faster than if they left their rooms undressed. This is great news for property owners who want to sell their homes as well as those who want to enjoy their living spaces for years to come. Carefully selected trim work is a classic adornment to any space that transcends most interior design trends. In general, property owners do not have to worry about whether or not a prospective buyer will view the crown molding or chair rail that they installed in their home 10 years ago as dated. If the trim work is properly maintained, it will still create the polished look that most people consider timeless. Trim projects can be undertaken using a variety of materials, and the aesthetic differences among those materials are barely noticeable once crown moldings and chair rail have been installed. The most common types of trim materials on the market today are wood, plaster, medium-density fiberboard (MDF), polyurethane and polyvinyl chloride (PVC). Genuine wood trim materials come in stain and paint grades. High-quality hardwoods such as maple, oak and walnut are used to craft moldings that spotlight the natural beauty of wood with stains and glossy varnishes. Lower-quality woods are used to create paint-grade moldings, which must be coated with an attractive paint color to provide professional results. Trim installers like to use wood to create moldings because it can be easily cut and shaped with the appropriate miter saw and sander. However, real wood can be expensive and is susceptible to rot due to moisture. This can present a problem in some homes’ kitchens and bathrooms. Plaster moldings yield elaborate designs that one cannot accomplish with standard woodworking implements. While plaster trim looks great, it is even more expensive than wood. It also is subject to cracking over the years. MDF trim, which is made from glued wood fibers, is a cheaper alternative to solid wood trim. MDF is also relatively lightweight, easy to cut and a breeze to paint. Just like wood, it is susceptible to moisture, which causes it to warp. Polyurethane is a trim material alternative that withstands moisture and is less expensive than wood. Finish contractors like using this material because they can saw and paint it in a similar fashion to wood. Polyurethane is softer than most solid wood species, and this is a key disadvantage when it is used to create chair rail trim that must withstand a lot of dings and dents. PVC is used as a common trim material in bathrooms since it will not rot. While the plastic material is generally long lasting, it can’t be fashioned into custom designs. It also isnâ€™t currently manufactured in a variety of profiles and styles. We have to admit that the ornate, intricately crafted crown moldings that adorn many of the rooms in large, historic homes are magnificent to behold. The oversized molding and chair rail are what give these properties so much character. However, the style and size of the trim must fit the architectural design of the home and its interiors to achieve professional-looking results. For instance, the detail-rich trim that enhances many traditional interiors would look out of place in a room that features contemporary design elements. One’s crown molding and chair rail should also be kept proportionate in scale to the roomâ€™s size. Besides style and size, color is an important consideration when installing trim. Crown molding and chair rail should be painted or stained in colors that provide contrast to walls and ceilings to make finish work really stand out. Choosing the right trim styles, sizes and colors for different rooms takes practice. Our experience and skills have made us a go-to source for custom design, build and installation of chair rail and crown molding in Orlando. Hanging trim in one’s home or office does not always ensure a sophisticated look. As carpenters who have served in the Orlando area for several years now, we have seen our share of do-it-yourself (DIY) attempts at crown molding and chair rail installation. Due to settling, it is rare that a structureâ€™s ceilings and walls are perfectly straight and level. Installing crown molding is a great way to hide these types of imperfections. However, those wavy ceiling surfaces can present quite an obstacle for novice trim installers. When trim work is not professionally installed, there are often large gaps where moldings meet ceilings or walls. Small gaps of 1/8th inch or less can be fixed by caulking. Another tell-tale sign that trim work has been improperly installed is misalignment of molding patterns at corners. To achieve fantastic results, precision measurements and cuts are required. Sometimes the installation of corner blocks is a feasible and decorative way to cover these types of mistakes. Our clients realize that improperly installed trim looks sloppy and can take away from their property’s appearance. It can also lower the propertyâ€™s value in the minds of appraisers and prospective buyers. That is why Orlando property owners frequently rely on us for all of their finish work and woodworking needs.